Welcome to the United States of Nigel Farage who publicly concurs that our beloved NHS should be like America where you need to have health insurance before you receive treatment with the intentions of doing a deal with the Conservatives which backed fired on them as UKIP policies are up in disarray as they continue to flip-flop in what they want on their policies which they have no clear idea what their supporters want to see in their manifesto. The leader of UKIP(Nigel Farage) has let the cat out of the bag for all to see a Secret documents leaked from a Ukip executive meeting appear to suggest that a government under Nigel Farage would consider plans to privatise the NHS and use current policies as a stepping stone to more “radical” change. Mr Farage has repeatedly denied that Ukip would seek to privatise Britain’s health service if the party got into power, refusing to go further than telling the BBC’s Nick Robinson that “we are going to have to find ways” to deal with caring for a growing, aging population. But videos have emerged showing the Ukip leader advocating an insurance-based system in the past, and according to Political Scrapbook newly-leaked documents show the party’s ruling committee unanimously approving a pro-privatisation policy at a meeting in October 2012. The minutes from that meeting reportedly show executive members complaining that “the NHS is highly valued by the British people, despite its problems and limitations”, while another said that “we cannot change it wholesale because the public love it”. Agreeing that a Ukip government would commission a cost-effectiveness study into privatisation while more minor policies were pursued, another said: “We can focus on stopping health tourism; we do not have to commit ourselves much further. The Prime Minister replied: “The honourable gentleman comes to this House week after week to talk about the NHS in Kent, well Mr Farage said this [in 2012]: “We’re going to have to move to an insurance based system of health care. Britain would end up squandering billions on a new health service bureaucracy if Ukip leader Nigel Farage gets his way, experts warned on 20 January 2015. They hit out after the ex-City banker turned party chief confirmed that he wanted to scrap government funding and usher in an insurance-based system. So far UKIP proposals have been kept on a back-burner, Nigel Farage told the BBC. And alarmed health experts warned against Mr Farage’s continental-style plan. Health Emergency campaign director Dr John Lister said: “Pro-rata they spend a lot more on health than we do it’s a very inefficient system. The top three most costly systems in the EU are the Netherlands, France and Germany, which spend between 11.6 per cent and 12 per cent of GDP a year on a labyrinth of insurers and private or independent hospitals. Britain only spends 9.6 per cent but gets more per pound because the NHS offers “much better value,” Mr Lister said. Well it comes as no surprise that Ukip is not opposed to the corporate takeover of all our public services. Until people realise that UKIP are strongly affiliated to the U.S. Tea Party movement and they are heavily influenced by private individuals who are multimillionaires both in America and UK which UKIP leadership is currying to gain favours should they be in a position of a coalition. Some disturbing political news from across the pond: in two by-elections on Thursday, the xenophobic U.K. Independence Party won its first seat in the House of Commons and almost won a second. The victory came in a formerly Conservative-held seat in Clacton, east of London, where the party’s representative thrashed the Tory candidate, delivering a humiliating rebuke to Prime Minister David Cameron. The near-miss came in Heywood and Middleton, a Labour stronghold in Greater Manchester, where the UKIP candidate was just six hundred votes short of winning. 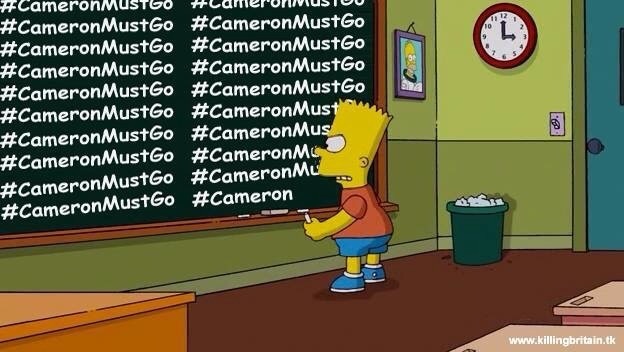 The scenario that Cameron described is perfectly plausible. But the larger story goes well beyond the Westminster horse race and, indeed, beyond the shores of the United Kingdom. The rise of UKIP demonstrates, once again, that the politics of protest have shifted. From the French Revolution to the Great Depression and beyond, hard times tended to benefit progressive and left-wing parties, which critiqued the extant economic and political systems and offered blueprints for reforming or replacing them. These days, the primary beneficiaries of economic slumps are often right-wing groups, such as the Tea Party, the French National Front, and UKIP. Wrapping themselves in the flag and excoriating what they view as a corrupt élite, these protest parties attract the support of alienated voters from across the political spectrum. By channelling economic distress and cultural alienation into resentment of foreigners, welfare beneficiaries, and government officials, they come to drive the political agenda. Meanwhile, avowedly left-wing parties, where they still exist, hardly get a look-in. And moderate progressive parties, far from being presented with an opportunity to enact an egalitarian agenda, are forced to back up and defend basic institutions of social democracy, such as progressive taxation and a universal social-safety net. In the United States, the Obama Administration, to its credit, has offered this defense. By getting the Affordable Care Act enacted, it even managed to fill a big gap in the safety net. In Britain, by contrast, the Conservative–Liberal coalition, working under the banner of austerity, is steadily chipping away at the welfare state, cutting the level of benefits, tightening qualification requirements, and forcing students to pay more. But even that agenda isn’t tough enough for UKIP, which, in addition to bashing immigrants and Eurocrats, makes a fetish of targeting “scroungers” who subsist at the taxpayers’ expense. Of course, I am generalizing there are exceptions that go both ways. Acute economic distress led to the New Deal and to the creation of the welfare state, but it also aided the rise of Fascism. Back then, though, the right didn’t have it all its own way, not even in Weimar Germany. (In the 1930 general election, the Nazis got eighteen per cent of the vote, setting them on the road to power, but the Communist Party, with thirteen per cent of the vote, also saw a surge in support.) Today, things are different. Greece and Spain are about the only places where the radical left, in the form of the SYRIZA and Podemos parties, has benefitted from the great financial crisis and its aftermath. (Jonathan Blitzer wrote about Podemos on Tuesday.) But, even in those places, there is no immediate prospect of a genuinely left-wing government taking power. And in Blighty we are treated to the site of UKIP‘s leader, Nigel Farage, a former commodities trader turned rabble-rouser, celebrating his latest triumph by boozing it up in a Clacton pub until five in the morning, then emerging to say that he’d like to be the Minister for Europe in the next Parliament. Although you never can be sure with Farage that was presumably his idea of a joke: UKIP is committed to pulling the U.K. out of the E.U. To be sure, we’re just talking about two by-elections. 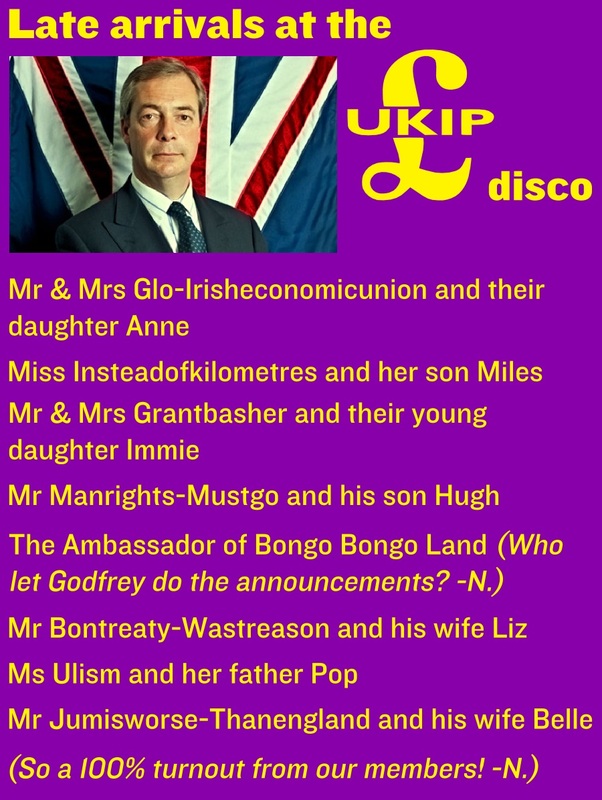 Come the general election, protest parties tend to fall back UKIP may conform to that pattern. For now, though, Farage is setting the political agenda, and some of the other parties, particularly the Conservatives, are pandering to him. Cameron has already promised a referendum on Britain’s continued membership in the E.U. 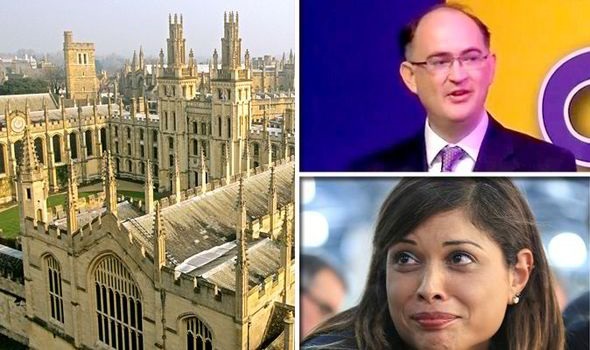 Last week, at the annual Conservative-party conference, he announced that, even before the referendum takes place, his government will scrap the Human Rights Act of 1998, which enshrined the principles of the European Court of Human Rights into British law. But that announcement wasn’t enough to check the progress of UKIP. And where is the equivalent of Farage on the left? Nowhere to be found. NHS was born in a Labour Government 1948 which the Conservatives were strongly against the idea at the time. Our NHS has become very popular and envied by the rest of the world. But it has never been accepted by the financial free marketeers who oppose the very concept of our Beloved NHS funded out of taxation and would like UK to have an American style system where health costs are very high and large numbers of people cannot get health cover. Under the Tories the NHS is under threat. Before the last general elections David Cameron was quoted “NHS is safe in his hands”. We all know what happened since Andrew Lansley was appointed Health Secretary who is quoted “The NHS had to cut its cost by £20 billon during this parliament”. The result is many hospitals have lost their A and E Departments; hospital waiting list has increased and already poorly paid NHS staff have had their pay frozen. Hospitals all over UK have not been able to meet its national targets and the Regular has intervened. The new head of NHS England has said the NHS needs an extra £8 billion to survive. Nobody should see the end of our NHS. Surprise, surprise, this coalition is not listening to the voters. Instead their message comes across as Us and Them if one time to read their message or listen to what they have been saying for the last four and half years. Let’s look at their scratch record they claim that more people are in employment and they have taken the lowest paid out of benefits. Really there are many will inform this coalition their plans are not working and if that is the case why are there still long queues for food banks and some people are turning to legal loan sharks just to make ends meet. Oh wait a minute, of course it’s election time from now to 7 May 2015 and many political parties will be door knocking to gain your votes. Instead this coalition continues with their mantra “We need to fix the economy that Labour left us”. The truth is the coalition government has conveniently forgotten a very large part of people who have helped to build this country of ours and they are the disabled some are veterans who served our nation and there are still some who have paid their contributions via tax during their working life they are the forgotten lot. To make matters worse this coalition introduced the Health and Social Care Act 2012 which does not help the disabled or with people with disabilities. The founding idea of a democratic society, whether you’re on the left or the right, is that people should be able to go about their lives with dignity, fair treatment and independence. But reality doesn’t often match up with lofty ideals. The Tories’ decision to axe the independent living fund is one such example. Independent living does what it says on the tin equip disabled people with the resources they needed to lead happier, healthier, freer lives. 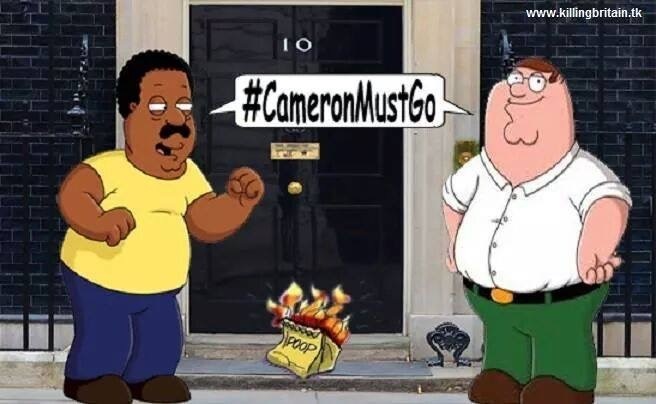 Not any more, if this government have their way. What the ILF cut shows is that the powers that be don’t care too much about people standing on their own two feet, or even about saving money cuts like this fund or the bedroom tax make only a small change to national finances. Tory governments have been happy to let the benefit bill soar by institutionalising unemployment, underemployment and pitifully low wages, and let the housing benefit bill soar by breaking up social housing. Nonetheless, anger at the Tories’ seemingly thoughtless assaults on the services and support we depend on is hardly new. If people have worked in local government and hearing that once again our budget has been cut by several orders of magnitude than the budget of wealthy Tory-controlled authorities which has a knock on effect to other councils which has been standard practice for nearly five years now. 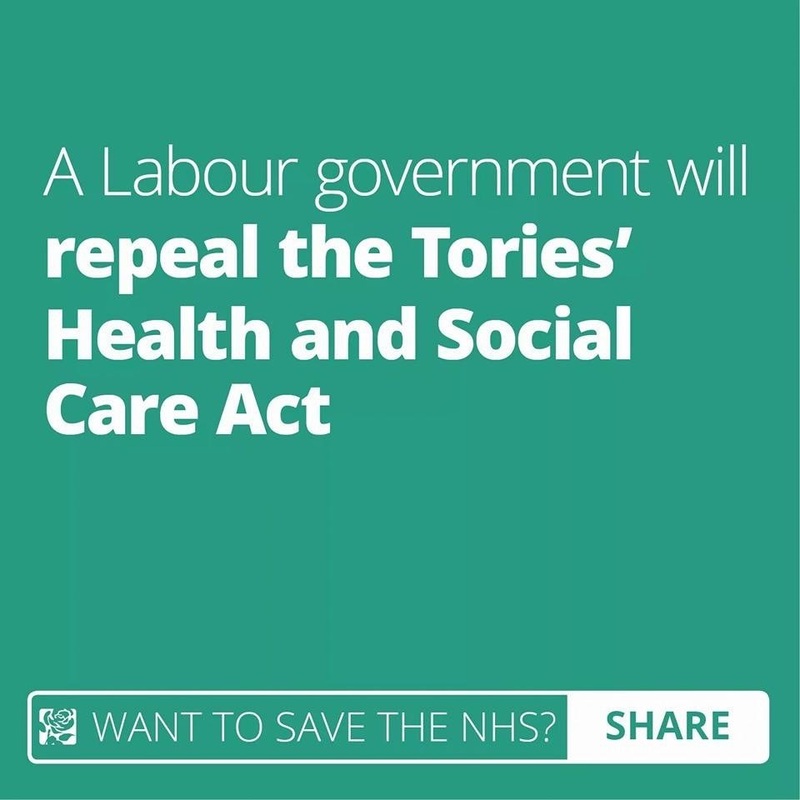 What’s more exciting is Labour committed to repeal Health and Social Care Act 2012 . The 2012 Health and Social Care Act came with the promise that local people would have the final say in who ran their services. Instead, it allowed a huge increase in NHS privatisation . A staggering number of NHS contracts have gone to the private sector since the Act was introduced. Nearly seven out of ten according to campaign group the NHS Support Federation. But the Tories aren’t going to stop there. They may deny they want a US-style system where those that can afford it get the best care through private insurance and those who can’t put up with long waits and are denied life-saving treatments. A two-tier system is what we’re heading for though under Cameron. Lansley’s changes to the NHS have already left no control. The money goes in but no one is in charge of it. Instead, we’ve handed over the money to doctors and left them to get on with it. The result is a care ‘lottery.’ Any chance of getting the best treatment is down to luck and where you happen to live. For the NHS to be reformed we need to take back the power- the clue is in the title ‘National’. But they’ve broken it up into tiny parts. There’s this myth that a US-style healthcare system is more efficient. It isn’t. The US shows the private sector doesn’t necessarily deliver more for less or is more efficient. Instead, it spends comparatively more on hospital admin costs than other countries including England and Scotland. And the vicious response to President Obama’s healthcare reforms tells you everything to know about the culture of private healthcare. America’s healthcare industry spent millions of dollars to block the introduction of public health insurance and protect their financial interests. You’d have expected the health service to be on Cameron’s list of six election priorities for Britain. But no, saving lives wasn’t important enough. 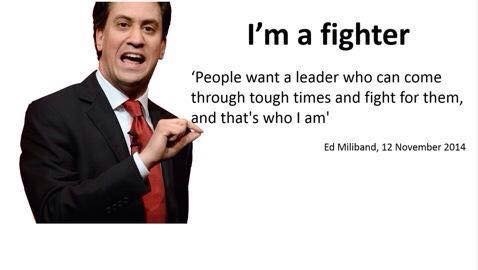 Funny that because in 2010 he said the NHS would be his number one priority. It’s yet more evidence that he lies- not that we need any. 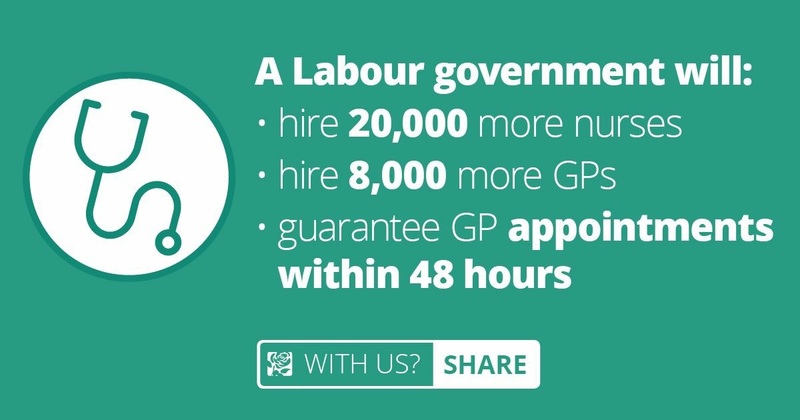 Labour is going to make the NHS a priority. We’ve fought to protect our health service for nearly 70 years so we’re not going to let Cameron flog off our most precious asset now. We’re going to campaign on every doorstep for what matters. An NHS that gives everyone access to the treatments and services they need. Because we know that matters to the people of Britain. In the very week of their campaign launch, Labour are being blocked by the media. We’ve seen their press team boast that, contrary to the Tories’ attack dossier, they would in fact be keeping all cuts to the arts budget. We’ve seen the shadow education secretary softly saying that schools in certain regions should have their funding equalised with London ones, rather than stridently saying that this government’s programme of cuts and stealth privatisation is hammering our education sector into the ground and investment is needed across the board. And we’ve seen a heartfelt letter from a lifelong Labour voter begging his leader to save the independent living fund. To those of you who think you can pull down the system by not voting Labour, or not voting at all. This is not just about Britain and Europe. It’s not just the British elite. Now if you are arrogant enough to believe that you can change that, you are on a hiding to nothing. 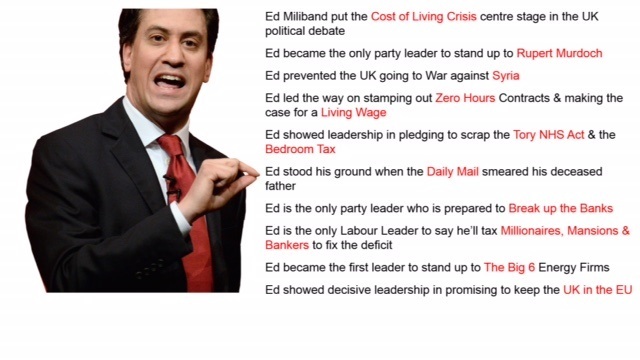 I’m going to vote for Labour because only when all countries have a leader like him will things change. That however is not going to happen, so I’m voting for the very best option that I believe we have to save as many people including our children and grandchildren from not just further suffering, but to give them just a little bit of hope. 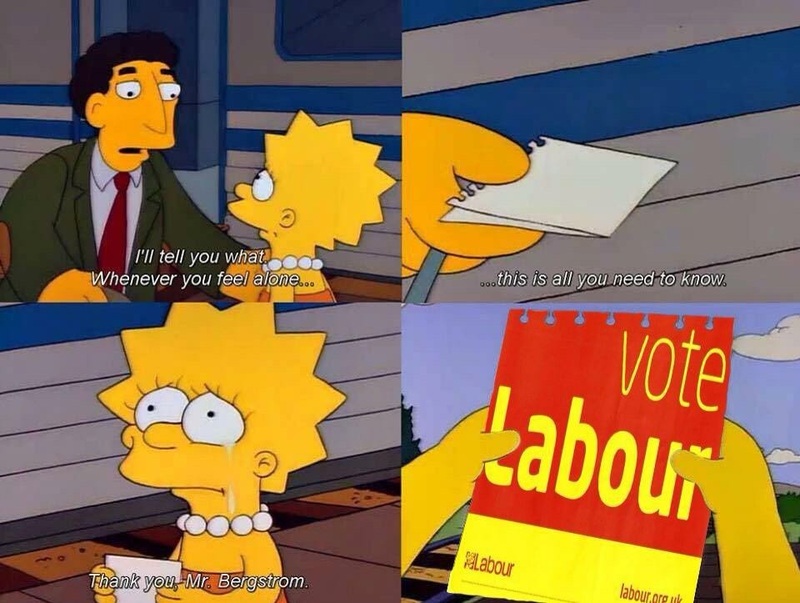 Suffering will be their lot and ours if the Conservatives get in again, but from now until May I will not rest in my efforts to ensure a victory for Ed Miliband. Remember a vote for UKIP will see another coalition with Fibdems, a vote for the Greens, Fibdems, SNP, Plaid Cymru will a return of conservatives. ask them what are their policies for the diabled. 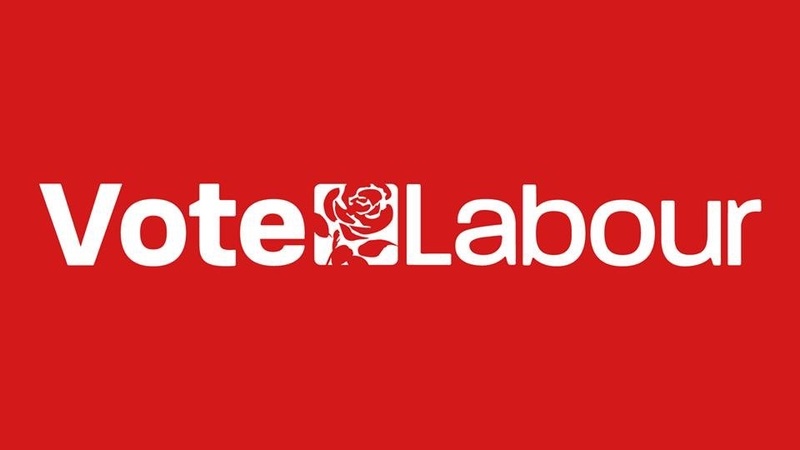 I urge all to vote Labour on 7 May 2015 as Labour is the only party that can deliver. It has been purported that Labour has allegedly lost its way; I would like to put the record straight. Labour has to deal with the realities of where the wider public are, If all Labour did was follow a very narrow path it would never stand a chance of winning elections. Labour has to be about everyone in society not just one section. If we ever forget that, then there is no point to having an opposition to the Tories because we would never have any MPs. Fairness, Equality and Social Justice are not just for working class people, they have to be for all in society. I do not want people to forever who to struggle to make ends meet, I want them to have the same life chances the very rich take for granted. The centre ground is where Labour needs to be so it reflects fairness for all. Labour has not lost its way, Labour has to deal with the realities of where the wider public are. If all Labour did was follow a very narrow path, as some parties tend to do, it would never stand a chance of winning elections. Labour has to be about everyone in society not just one section within. If Labour loses touch and only speaks of working class people, then being in opposition will become the norm. Labour will do plenty to challenge attitudes but that is all pointless if not get elected. My point is, I hear too much about fairness, equality and social justice but only aimed at one section of the public. That is not right and it should be challenged. Labour can achieve plenty for all people if it stays in the centre, which is not naive that is political reality when it comes to how people vote. Labour is not pandering to right wing views, but it has to deal with changing attitudes of the public. Messages and how it says them have to keep afresh so they can challenge what the right do that is wrong. Just because the language sounds different does not mean Labour is lurching towards the right. Labour has to speak to the largest number of people and inspire then to vote across all sections not just one. I disagree on various levels with many comments but that does not make the party fractured. It’s because the Labour Party is a broad church of views. Now because of that it can have open disagreements among members and supporters. That however is not the case with the Tories, if they speak again Tory policy it normally spells the end of their careers. There have been claims and counter claims that whilst Labour was in Government, they were responsible for the recession. 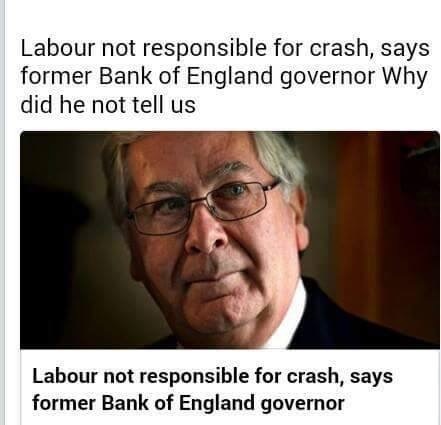 Well I’ve news for you coalition spin all you want but Labour is not for turning as we all know that The Labour government was not to blame for the financial ­meltdown, the former Bank of England chief said. Mervyn King, now Lord King, said “no government” could have prevented the recession which followed the global economic crash in 2008. He said: “The real problem was a shared view across the entire political spectrum and the financial markets that things were going pretty well. Lord King was the Governor of the Bank of England from July 2003 and July 2013 and his comments will come as a bitter blow to David Cameron. The Tory PM has frequently accused Labour of “crashing the economy” while in power in a bid to scare voters into backing the Tories instead. believes policy makers have “not yet got to the heart of what went wrong”. Speaking on Radio 4’s Today programme, Lord King admitted dealing with the financial crash had been both “exciting” and “fascinating”. The good news is that Left and right united to brand David Cameron and George Osborne liars after they falsely claimed to have halved the budget deficit. Privileged Prime Minister Mr Cameron told an audience in Halifax that May’s poll would be “the most important election in a generation.” Meanwhile the Chancellor addressed a meeting in Tory target seat Twickenham, where his Lib Dem Cabinet chum Vince Cable is MP. The new poster boasts of “1.75 million more people in work” and “760,000 more businesses,” despite millions still languishing in part-time and insecure work and bogus self-employment. The fall in the annual budget deficit from the 2010/11 financial year, which had already begun when the Con-Dem government took office, to the current financial year, has been just 27 per cent. If the drop were to be calculated using the 2009-10 financial year as the starting point instead, the fall would still be only 36 per cent. Tory press officers said the ratio of deficit to gross domestic product (GDP) had halved claiming the word “deficit” could be used to refer to this ratio. In a blog for the Spectator, Mr Nelson wrote: “(I) don’t dispute that the ratio is widely accepted and more useful to economists, but a deficit/GDP ratio is different to ‘the deficit,’ which is measured in pounds. Andrew Fisher, Left Economics Advisory Panel convenor and author of The Failed Experiment, blasted Mr Osborne for piling misery on workers. “George Osborne has created a new category chancellors who start off badly and go downhill from there. Far from eliminating the deficit, Osborne’s austerity programme has succeeded only in driving down living standards and racking up ever higher debt”. “This poster will fool no-one in Halifax. The last four years have seen job losses, cuts and service reduction across the town”. Ridiculing the Tories’ botched campaign poster, which falsely claimed the Con-Dem government had halved the deficit, the Labour leader will say the election can be won through an ambitious campaign of individual conversations with the party. Mr Miliband will scornfully characterise Tory plans post-2015: “Keep driving along the Road to Nowhere, but press down on the accelerator. Setting out Labour’s alternative, he will tell a Manchester rally: “We will offer hope, not falsehood. We know the depths of our values matter more than the depth of our opponents’ pockets. Research by the Labour Party revealed that 44 Tory candidates in the 130 most crucial seats in May’s poll had either worked for financial services companies or accepted donations from them. 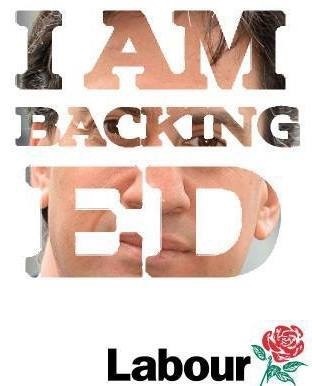 Focusing on living standards and the NHS, Mr Miliband will pledge to “put working people first. “It’s the first time since the 1930s that working people will be worse off at the end of a parliament than they were at the beginning,” he will say. And he will reiterate a series of pledges including a guaranteed GP appointment within 48 hours and an £8 minimum wage. But kowtowing to right-wing rhetoric, the opposition leader will also promise to make immigrants wait longer before claiming benefits along with budget constraints that will lead to more austerity. Let’s take a look at the Fox ban by now many would recognise it was a Labour that brought in the ban and as many would understand that the Conservatives and UKIP want to repeal the ban. This makes me ashamed to be part of the human race, just five of these amazing animals are left in the wild. The rest have been killed by pathetic people who get their kick from killing them for fun. While others died for the stupid belief that rhino horn can make them good in bed. If you do not know how already no potion will ever do anything to change that. Hunting is a disease on the word a total cancer and that needs cutting out, Nobody regardless of who they are has any rights to hunt any animal. We cannot let idiotic blood junkies and thick people destroy nature further. Too many animals have been made extinct due to stupid people. Hunting should be illegal and should always be met by prison time. But let’s also have prison time for the idiots that cause the demand in rhino horn. Not just the poachers but the trash who demand it. Wildlife is too important; it’s time to start treating this crime more seriously. The hunting spin and that of the Countryside Alliance, sections of the press, David Cameron and Nigel Farage never match their claims. Support for hunting is tiny and has been for decades, and the hunting lobby know it. They are desperate for you to believe they have more support than they do. The only way these cruel people can succeed in repealing the hunting ban is with the election of another Tory Government or in UKIP MPs getting elected. For the sake of our wildlife the Tories must be defeated so the vile activity of blood sport is consigned to history where it belongs. Nigel Farage gets on the fishing committee to gain votes never once votes for anything to do with fishing then never show up for the fishing committee meetings just another full of s**t corrupted politician no different from the rest a vote for ukip is a guaranteed win for David Cameron. I’m not sorry to say the likes of UKIP cannot be now taken seriously any more they flip flop on a daily basses. What stood out was that Farage is happy for people to rip animals to bits for sport. Right here, right now it’s about fox ‘hunting’. UKIP MEP’S voted no for banning ivory, why wouldn’t they vote in favour of wars? 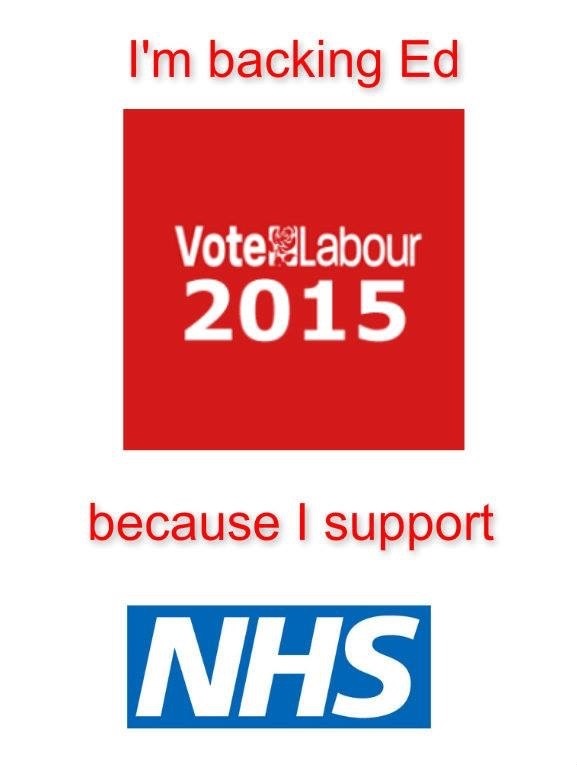 If people do not vote Labour on May 7th then the NHS is finished. The Tories will get in because with people voting Green, SNP, UKIP, LibDems it will take away MPs from Labour and will lose them the majority they need. Small party’s are not going to be winning lots of MPs if any. But they will reduce the votes in that seat and prevent Labour winning. 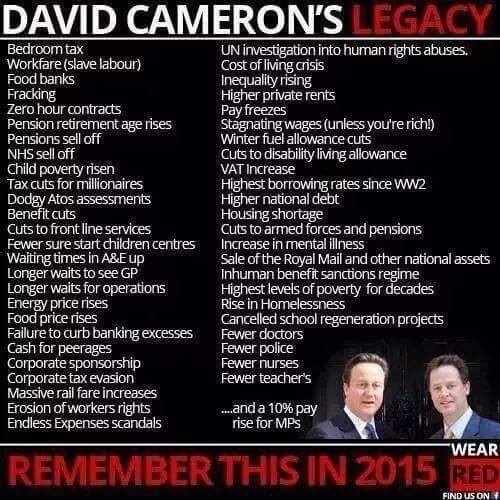 People need to work out what is really important, getting rid of Cameron or just buying into the lie that Labour is the same as the Tories which is just rubbish! Labour can win the election but if you want a change of Government than vote for them. Whilst on my hobbit’s journey during the festive seasons I had time to reflect what made my year for 2014. 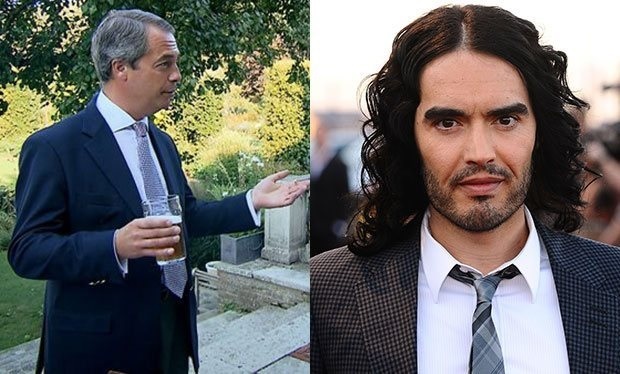 I have to say it’s got to be none other than Russell Brand vs Nigel Farage with other guest speakers on the Question Time. 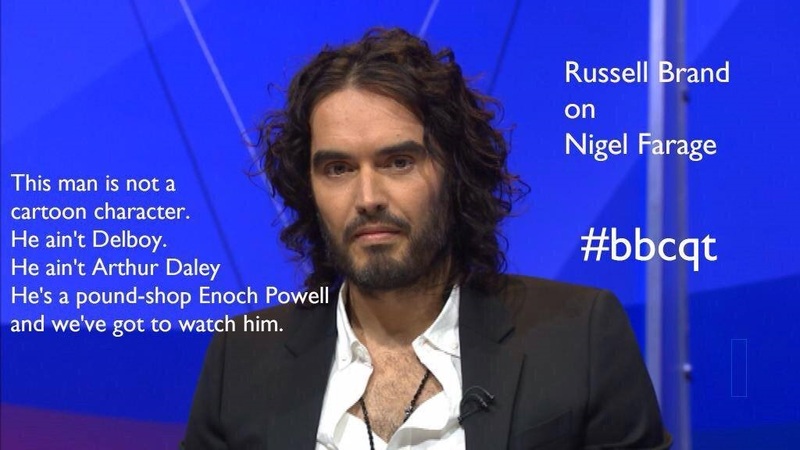 Normally I would not have the time of the day for Russell Brand but he really made my night watching the debate. Over the past few weeks some of my colleagues including myself have been following the progress of the UKIP and speaking to some close allies from different sections of the communities. We looked at their list of target seats compared it to the last General Elections between 2005-2010 and the recent By-elections in 2014 it’s not rocket science for many to understand that the two seats are strong holds of the Conservatives which the two members of parliament who cross over to UKIP in fear that they may lost their seat in 2015 to UKIP and the cost of tax payers hard earned money to fund the elections. 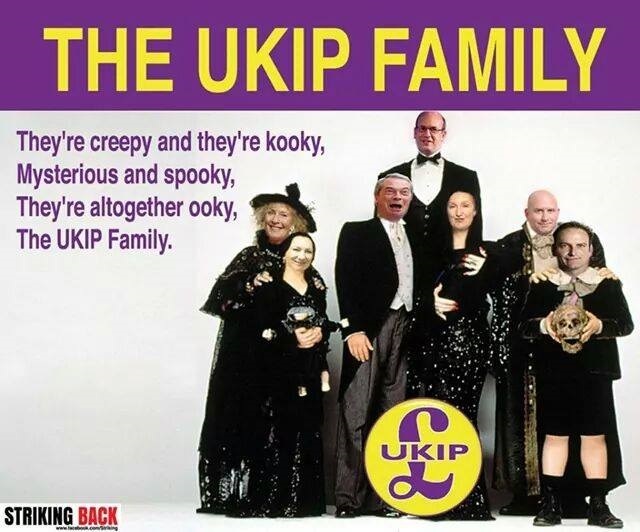 There was nothing stopping them resigning from the conservatives whip and they would be independent MPs until 7 May 2015 then stand as UKIP candidates. But instead they wanted to send out a statement to the coalition. Ukip is clearly taking the British debate about migration to a new level. A former UKIP candidate has been jailed for two years after admitting attempting to engage in sexual activity with a 12 year old girl. Nigel Farage says Ukip candidate in ‘Chinky’ race row is just a rough diamond. When its leader Nigel Farage claimed he missed a speaking engagement in Wales because of “too many immigrants on Britain’s motorways,” he was clearly making connections that many of us have missed. Perhaps, however, there is a need to widen the terms of political debate about “migration.” And it might be helpful if the major parties ceased to pretend there aren’t complicated issues to address. So, if only in terms of European migration, there are over 2.2 million migrants that Britain needs a more honest conversation about especially since some of the more popular caricatures about them turn out to be true. Most think there should be no government restrictions on where they live and what they do. Many are economically inactive. Others take jobs that might otherwise go to local people so it’s alleged yet there is strong evidence that most immigrants who enters UK contributes to our economy. Whatever their status, most take more money out of Britain than they spend here. So, it’s time for a more honest discussion. What Are We Going To Do About The Brits Abroad? It is a picture that can be truly worrying. A million British “migrants” have decamped to Spain — some with barely two sentences of Spanish to rub together. France and the Republic of Ireland now play host to over a third of a million Brits, settled within their lands. Germany is the only other country to top the 100,000 figure for British migrants, but one glance at the map sees us scattered far and wide across the European landscape. In or out of the EU, if Ukip gets its way on a right to send migrants back to where they came from, Britain will need a serious plan about where to put its own “return to sender” migrants if other countries take the same view. This may not solve Farage’s motorway congestion problems, though he would doubtless be comforted to believe he was in a better class of traffic jam. But the real problems run far wider. Even if you could “notionally” swap 2.2m of “ours” for 2.2m of “theirs,” there is bound to be a jobs/skills mismatch. What jobs would Britain need to fill? What skills would be needed? Which parts of the country would our returned migrants need to be sent to? Of course, many “returned migrants” would find themselves in competition with those currently passed by in Britain’s jobs market. But for what jobs? Social media sites are now being used as platforms for the “migrants take our jobs” appeal to young and not so young voters. For those facing zero-hours contracts in zero-prospects jobs, this can be a powerful, and accessible, explanation of an economy that fails them on a much bigger scale. Banking has become Britain’s new welfare state. In Britain, making money has long replaced the idea of making things. An economy that no longer presumes to produce for itself also loses interest in providing the skill base that tomorrow’s sustainable economy will rely on. That is why Britain faces a chronic skills shortage. In most of our major towns and cities there is an easy way of testing this out. Try to get an emergency plumber or electrician to come out over the weekend to rescue you from some domestic mishap or other. Odds are that the only ones you find will turn out to come from eastern Europe which is a good thing if there is not enough trained plummers around to do the job. Colleges offering English language courses have waiting lists of migrants with construction industry skills, looking for a language base to underpin their trade. The last economic crisis saw Britain rescuing the wrong sector of the economy. Construction was thrown out of the window and the whole productive sector was told to stand outside the banks, hoping for loose change from the bonus payments being thrown at speculative traders. If Britain had had the sense to stipulate that these bonuses should all come in the form of bonds that the banks had to buy from the Green Investment Bank, at least the GIB would have had money to put back into the real economy. But we didn’t. So we end up with an economy seriously short of adequate skills and long-term job prospects. But the “send ’em all back” movement isn’t really focused on a skills gap. Its focus is on visceral prejudice rather than economic reality. Look at the jobs being done by migrants within the current British economy. You soon discover that employment itself is brutally divided between the jobs we can’t do and the ones we won’t. Travel on a night bus around London in the early hours of the morning. There are usually two groups of passengers. In the first are those with luggage, heading off to an airport for an early flight abroad. Here is a very simple message to all floating voters please read forward it on. The second are those on pre dawn shifts, doing the cleaning and servicing work that keeps London’s “respectable” daytime economy going. You can recognise this second group because they are either not British or not white. Alternatively, venture to areas of Britain where food is produced, picked or processed. You find a disproportionate number of migrant workers there too squeezed into overcrowded accommodation, working long hours, in poor conditions, for poorer pay. Then turn to the care homes and see who it is that wipes the backsides, cleans up after and cares for an increasingly ageing British population. And finally, take a look at the early morning shifts of those who clean our inner-city streets after the nighttime revellers have gone home. None of this is the space Ukip ventures into. 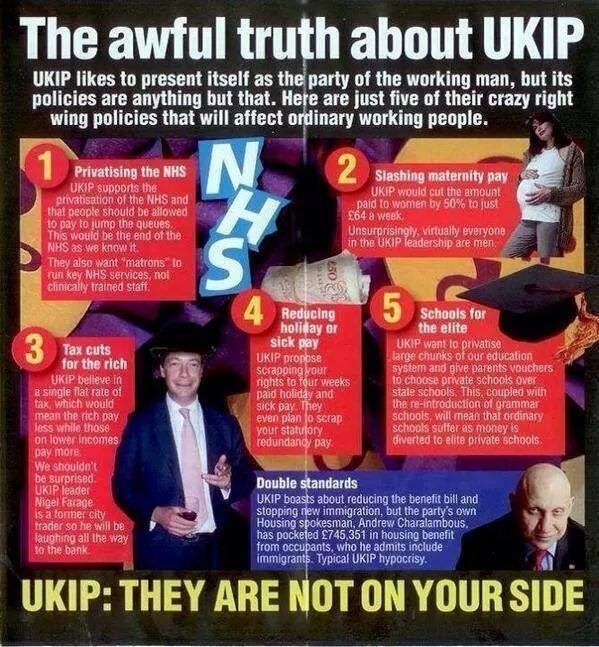 But once you’ve sent “them” all back, what exactly would Ukip’s marketing pitch be for the the jobs left behind? And in a society that struggles to get British men to clean their toilets at home, I can’t see a queue forming to clean other people’s. Oh sure. I can see Britons from all walks of life queuing for opportunities such as this. The reality is that the migration debate has become a “bread and circuses” distraction. In it, the dispossessed scrap among themselves while the wealthy look on. All debates about “austerity credentials” of the different political parties duck this colossal flaw in contemporary British politics. The real starting point is solidarity, not citizenship. When I had my first job, I remember asking my parents why I had to pay a NI contribution out of my wages. they told me to see it as a gift rather than a tax. After the war, their generation agreed to this as a way of making sure my grandad’s generation could have a pension. My contributions would make sure that, when it came to my parents turn to retire, there would be enough in the pot for them too. It was an act of solidarity from one generation to another. Underpinning this was another commitment from them to me. It was to the jobs, education, skills and apprenticeships our generation would need if we were to be contributors to this pot until our turn came to draw upon it. Its is further alleged that the last 30 years of laissez-faire British politics which individualised presumptions about pensions and NI contributions broke this bond between generations. This was when we were redefined (individually) as consumers rather than (collectively) as citizens. A new citizens’ movement is needed to reclaim this collective entitlement. One starting point would be restoring the right to insert “local labour agreements” in public service contracts. Britain seems to remain ideologically opposed to this, pretending that it breaches EU public procurement rules. Yet the private sector has been doing so for years, inserting “24-hour” response times for the supply of component parts or service/repair obligations. Other EU states do so by other means, but the effect is the same. You have to have a local base and a skill base if you want the local contract. Farage might actually approve of sticking two fingers up at the transnational in favour of the national. But he would balk at the idea that many of the skills we need to draw on may currently be found within migrant communities rather than his own. This leaves him stuck in the congestion of his own prejudices. It is not where Britain’s big economic debate should be. 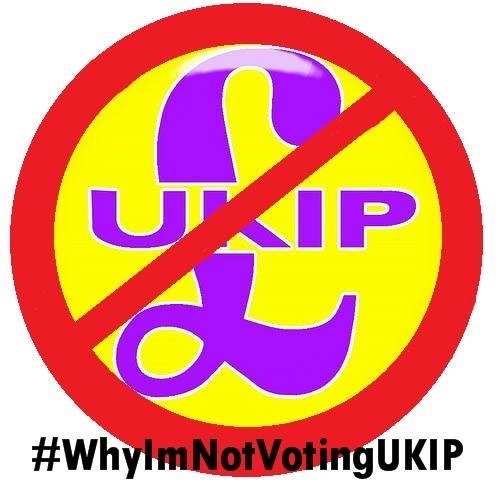 Political parties should be warned racing to join an intellectual tailback with Ukip is just the road to nowhere. The long delayed recovery has a long way to go, with GDP per head still 3 per cent below 2007 and pay 14 per cent down on pre recession levels. It is hardly surprising that voters angry at this prolonged recession are protesting at the ballot box. Our polling shows that many Ukip voters are white, male, over 40, working in the private sector and many used to vote Labour. Their key concerns are wages, job security and housing. Ukip would give millionaires a bigger tax cut than the Tories. Its 2010 election manifesto committed to drastically reducing the size of the public sector and getting rid of two million jobs. Ukip would get rid of workers’ legal rights on weekly working hours, overtime, redundancy, sick pay, pensions and employers’ national insurance obligations. Ukip would scrap the legal right to four weeks’ paid holiday. Ukip would not give apprentices the minimum wage. It would scrap all health and safety legislation except in the most dangerous of workplaces. Ukip wants to limit which employment claims can be brought to tribunal. Ukip MEPs voted against EU Parliament measures that would help workers facing mass redundancies and better health and safety and conditions for airport baggage handlers and offshore oil and gas workers. Last year, Ukip MEPs in the EU Parliament refused to vote for equal pay for women. Ukip would scrap the right to maternity leave and would cut weekly maternity pay by more than half. Farage failed to turn up to vote to strengthen the EU Posted Workers Directive to stop exploitation of migrant workers and did nothing to strengthen control measures to prevent the simultaneous undercutting of terms and conditions for domestic workers. His MEPs there abstained. He could have acted. He didn’t. Ukip MEPs have refused to support EU action for greater financial transparency, banking reform and against tax evasion, avoidance and fraud. Farage being a former City commodities trader himself, this probably shouldn’t surprise us. Many Ukip MEPs are climate change deniers and have weakened EU environmental legislation, hindering Europe’s transition to an energy-efficient and low-carbon economy. Ukip has tapped into concerns over more fundamental problems about Europe that we have to face up to. Whatever the European vision was on integration, harmony, economic advancement and political stability, what we currently have isn’t it. The free movement of labour and the single market were to be balanced by the social charter where all the people of Europe would live in freedom and with those in the poorer economies, benefitting from the harmonisation of standards across all member states. 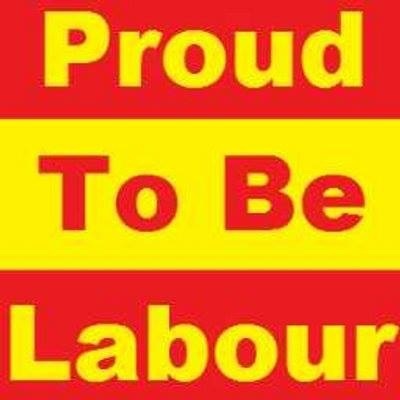 There were to be standards on workers’ protection, Tupe, excessive hours, health and safety, information and consultation and so many others that were meant to keep labour exploitation in check. That dream has been chipped away at for years. Right-wing governments and employers have engineered massive change in the direction of the EU vision. Judgements in the European Courts like Viking and Laval were the green light to massive assaults on organised labour across Europe, but especially in Britain. From Lindsey oil refinery to food production, we have seen workers recruited in certain member states by agencies and exploited. They were shipped in, literally, in order to undermine the terms and conditions of existing workers on those contracts. Both sets of workers have been let down by Westminster government, the EU Commission and the European Court. On exploitation, we shouldn’t blame the exploited we should damn those who exploit. And yet the exact opposite has been occurring up and down the country over recent years. 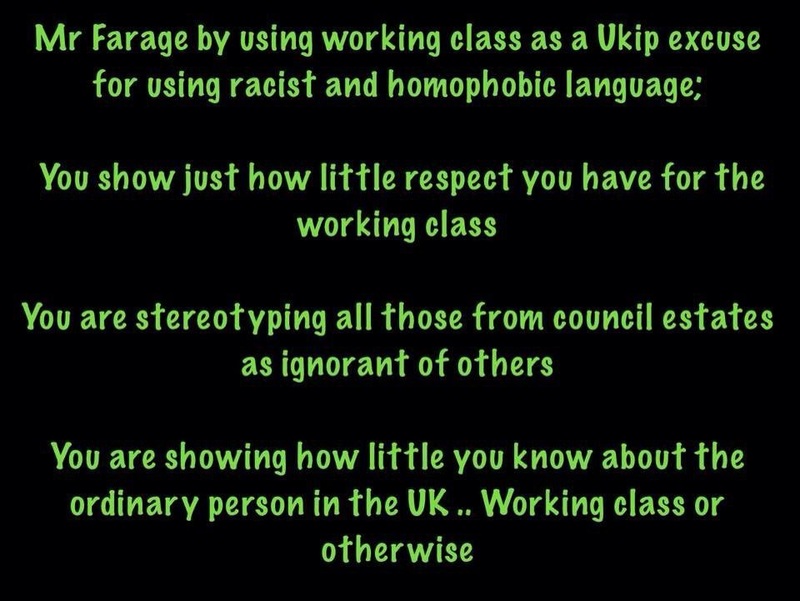 And that is part of the discontent that Ukip turns into xenophobic rhetoric to win votes. Look past the simplistic tag and face the challenge of exploitation. Let’s reach out to those migrant workers, not attack them but organise and protect them. Too many workers go to work fearful about exercising their basic rights. A new Labour government working with the EU has to create a workplace without fear and equip the trade unions to enforce it. The challenge for Labour in government is to deal with exploitation and harassment of workers who it has ignored for too long. Collective rights are the key to unlock that challenge. Take away our shackles and we will show you what enforcement is all about. We end 2014 much as we started it, but with an even more unequal society — a Britain that is more divided, a Britain where the haves are laughing at the have-nots, a Britain where it does no good to be poor, sick, young or working class. In the final death throes of 2014, never has this division became more apparent than with recent newspaper headlines. I’m sure many thought they had woken in a parallel universe when the Times named Nigel Farage as potentially “Briton of the Year.” Seriously. Briton of the Year. 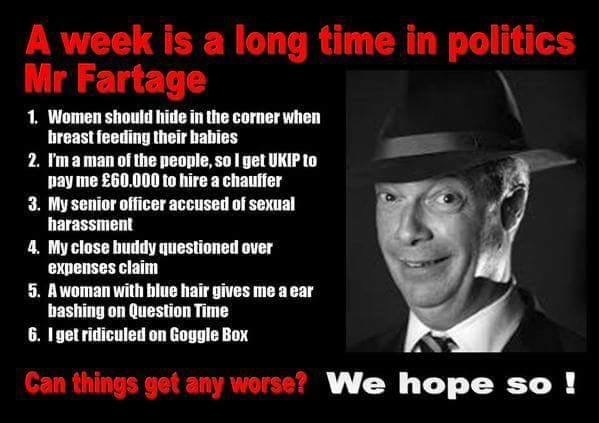 Farage a leader of a racist, bigoted, homophobic, sexist party who feels breast-feeding mothers should sit in corners and has numerous parliamentary candidates who try to outdo each other for over-the-top, outlandish, diabolical comments. 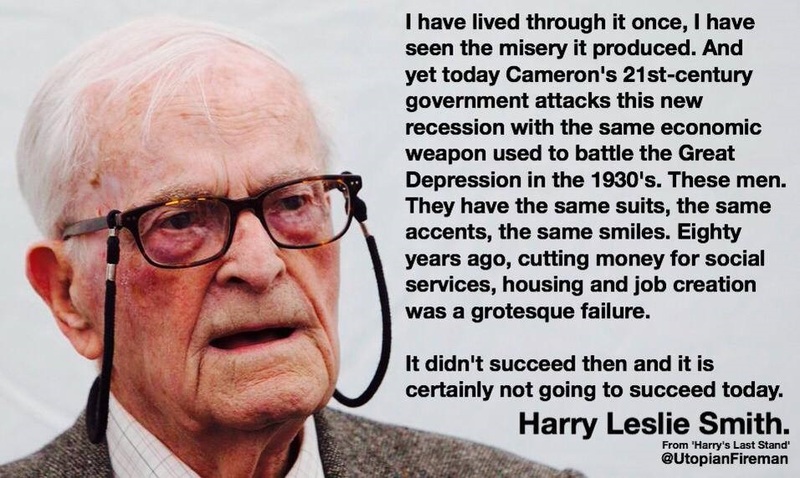 Briton of the Year in my opinion is 91-year-old Harry Smith, the NHS fighter who stood up at Labour conference and told David Cameron: “Keep your mitts off my NHS” in a barnstorming speech no MP could match in its passion as he warned us all what it was like prior to the conception of the NHS when his own sister died of TB in 1926. How can the Murdoch-owned Times to even contemplate Farage as Briton of the Year when we have Smith or indeed the inspirational Stephen Sutton who, while suffering from cancer himself, raised nearly £5 million for teenage cancer sufferers from his hospital bed, before dying earlier in May this year? Or there was volunteer humanitarian aid worker Alan Henning who was held hostage and then beheaded by Isis terrorists in October. These are the real true heroes and Britons we should be applauding, not the “pound shop Enoch Powell” that is Nigel Farage. And showing up our divided society further, the Mail showed us pictures of the royal family Christmas, complete with photographs of all the ornate Christmas trees in the many royal palaces and articles on the cost of the Duke and Duchess of Cambridge’s apartment refurb in Kensington. Costs to the taxpayer are spiralling it seems, yet we are assured that the Cambridges are buying all their own carpets and curtains. A collective sigh of relief then. While the royals enjoyed their Christmas, news of the utter tragedy of a couple from Sussex with two disabled children made the headlines briefly. The parents had celebrated a Christmas Eve dinner with family and left the children with relatives overnight. The couple were thought to be in deep financial trouble but kept it all to themselves. A neighbour found them on Christmas morning in an apparent double suicide pact. Without speculating too much, it is obvious that their money worries had reached a stage when they felt unable to cope or reach out for help. Caring for two disabled children probably had taken an immense toll on them too. People have no idea just how financially crippling it can be if you have a disabled child. Even with both parents, one often has to give up work to become a full-time carer. In this very sad case, caring for two disabled children was doubly tough. Yet this poor couple felt there was no way out of their financial problems and nowhere to turn. How many times have we seen the headlines in the past few years of people committing suicide who have been stripped of benefit entitlement through the government’s sanctions regime? People so desperate that they feel the only way out is to take their own life to prevent further suffering. Sixty cases have been looked into and this is only the tip of the iceberg. Sanctions for sick people claiming employment and support allowance have risen a staggering 470 per cent in 18 months, pushing the most vulnerable to the brink. This is our divided society. The press also treated us to a peek at Richard Branson’s Carribean island of Mustique, playground of the super-rich, with its secrets of guests eating caviar off a beautiful woman’s stomach and shooting golf balls at human targets dressed in sumo wrestling suits. The mind boggles. These are lives so removed from the ordinary world, yet our newspapers think we are interested and want to know about the pursuits of the rich and famous. On a slightly lesser scale, Farage dressed up in his customary tweed and went down to the Boxing Day Hunt. Not exactly the pursuit of the leader of the “people’s army,” eh, Nigel? Meanwhile back in reality, my 15-year-old son co-ordinated his school’s appeal for donations to the local independent foodbank. The latest stats on foodbank use are due to published shortly, and it’s predicted that the figures will be through the roof. Over one million people have been to a foodbank in 2014 and that is just to Trussell Trust ones. There are no stats collected from independent foodbanks. In Liverpool a 22-year-old councillor from Merseyside co-ordinated and ran Christmas dinner at St George’s Hall in the city on Christmas Day for elderly and lonely people and people who could not afford a Christmas lunch. Thanks to Jake Morrison’s Herculean efforts, 500 people enjoyed each other’s company and a Christmas dinner that they otherwise would not have had. This is what is going on in the real Britain we live in and not in Rupert Murdoch’s narrow vision of it. While the gap between rich and poor gets ever wider under this Con-Dem government, it will be the duty of the Labour Party, should it get elected in May 2015, to reduce the gap. It will be an immense task and certainly won’t happen overnight. David Cameron and his henchmen have done so much damage, it will take some time to challenge and reduce the wealth gap. But it has to be done. In the meantime ordinary people like us will continue to prop up our foodbanks so people in our communities can eat. But we want titles like Briton of the Year bestowed on those who truly deserve it people who have made a huge contribution to our lives, not stood at the bar pint in one hand and fag in the other, laughing at us.